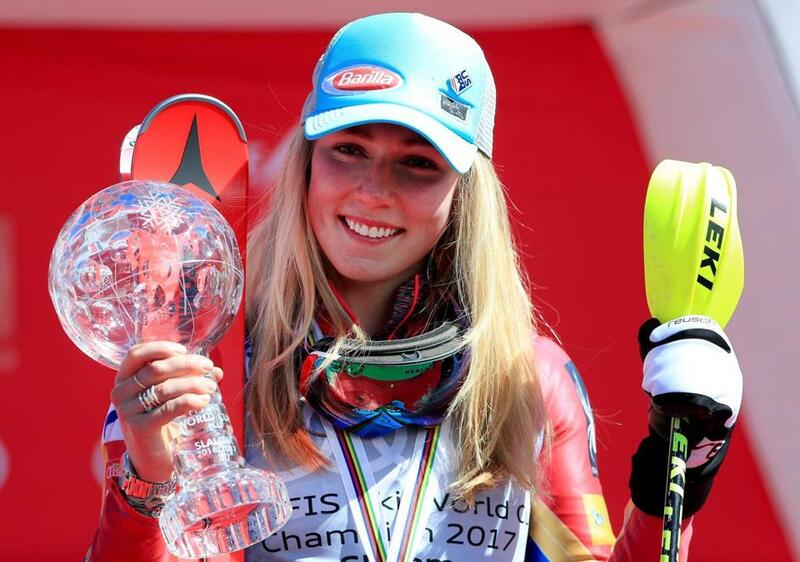 Mikaela Shiffrin shows off her trophy for winning the World Cup slalom season title. Austria’s Stefan Kraft set a ski jump world record during a World Cup even in Vikersund, Norway, jumping 253.5 meters in the first round of the team competition. That beat the mark of 252 by Robert Johansson of Norway earlier in the event. Before Saturday, the record was 251.5, by Anders Fannemel of Norway in 2015. The Norwegian team won, followed by Poland and Austria . . . Marcel Hirscher of Austria rallied to a giant slalom victory at the World Cup Finals in Aspen, Colo. He powered through the shorter-than-usual course in a combined time of 1 minute, 49.79 seconds. First-run leader Felix Neureuther of Germany was second, 0.53 seconds behind. Mathieu Faivre of France took third. Hirscher already had clinched the season-long giant slalom title along with his sixth straight overall crown. Germany’s Laura Dahlmeier secured the biathlon World Cup pursuit title after finishing ninth in Oslo. She added the pursuit title to the overall and individual discipline titles she had already secured. She can add another on Sunday in the mass start. The New York Jets signed former Dallas Cowboys cornerback Morris Claiborne to a one-year deal. Claiborne, the No. 6 overall pick in the 2012 draft, will help the Jets replace Darrelle Revis, who was released last week. Financial terms weren’t immediately available, but multiple outlets reported that the deal is for $5 million. Claiborne, 27, has been hampered by injuries during his career; he sat out the last nine regular-season games last year with a groin injury. Claiborne has four career interceptions . . . The Buffalo Bills addressed a key need at receiver by agreeing to sign free agent Andre Holmes. Holmes, listed at 6 feet 5 inches, spent the last four seasons with the Oakland Raiders. He was limited to 14 catches for 126 yards and three touchdowns in 16 games last season . . . Veteran kicker Nick Folk signed with the Tampa Bay Buccaneers, and he'll compete for a job with Roberto Aguayo, a second-round draft pick a year ago who was 22 of 31 on field goal attempts. Folk, 32, spent the past seven seasons with the Jets, converting 27 of 31 field goal tries last season. Illinois hired Oklahoma State’s Brad Underwood as its men’s basketball coach. Underwood led the Cowboys to an NCAA Tournament berth in his only season in Stillwater, which followed three successful seasons at Stephen F. Austin. Underwood replaces John Groce, who was let go earlier this month . . . A law firm that represents a woman who says she was sexually assaulted by three Purdue football players said the university has expelled the athletes. The Indianapolis Star reported the law firm Massillamany & Jeter LLP said the players were expelled after Purdue’s Administrative Board investigated an alleged October 2016 incident. The former players were not identified. Roger Federer defeated Jack Sock, 6-1, 7-6 (7-4), to reach the BNP Paribas Open final in pursuit of his record-tying fifth title in Indian Wells, Calif. Federer, the ninth seed, will play third-seeded Stan Wawrinka in an all-Swiss title match Sunday after Wawrinka eased past Pablo Carreno Busta, 6-3, 6-3. Federer, whose last Indian Wells title came in 2012, owns a 19-3 edge over Wawrinka, including 14-0 on hard courts . . . Andy Murray, the world’s top-ranked player, pulled out of the upcoming Miami Open with a right elbow injury. The Memphis Grizzlies signed Roxbury native Wayne Selden Jr. to a multiyear contract. Terms weren’t disclosed. Selden, 22, played three games for the New Orleans Pelicans this season before joining the Grizzlies’ NBADL affiliate in Iowa, where the swingman averaged 18.5 points, 4.8 rebounds, and 2.9 assists in 35 games . . . Josef Martinez scored twice in the second half, pushing his MLS-leading goal total to five, and host Atlanta United defeated the Chicago Fire, 4-0 . . . Dominic Oduro’s goal midway through the second half lifted the Montreal Impact to a 1-1 draw with New York City FC at Yankee Stadium . . . Jozy Altidore’s 80th-minute goal sealed Toronto FC’s 2-0 road win over Vancouver . . . Cyle Larin scored twice, including in the 73rd, and Orlando City beat the Philadelphia Union, 2-1, at home . . . An own goal by the San Jose Earthquakes in the 89th was the difference in Sporting Kansas City’s 2-1 home win . . . The Columbus Crew scored twice off penalty kicks in a 2-0 victory over D.C. United in Washington . . . Minnesota United and the Colorado Rapids played to a 2-2 draw in Denver.